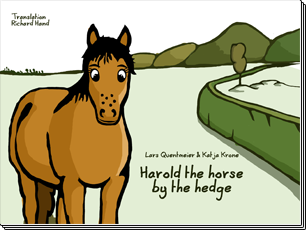 Harold the horse by the hedge is a lovely illustrated, interactive picture book for children. Harold meets a new unexpected friend, Manni the Mole. With Manni's map, the pair set off on an adventure to find the marked treasure. Their challenge - to find a way to cross the big green hedge on the border of horse kingdom and cow kingdom. The children have to help Harold and Manni as they try flying over, slipping past the border in disguise and digging under the hedge. A fun and enjoyable interactive story that can be read to or by the children. Some of the interactions are hidden, and the children have to be eagle-eyed to discover them. All scenes encourage the children to be creative. You may download our media kit (zip format), which contains useful facts, logos and images about "Harold the horse by the hedge". The information provided in our app should not be used as a substitute for the care and advice of parents and teachers. Your privacy is important to bytecombo. Our application does not collect or use any of your data.